Note: Competitors participating in the Underhand Chop or Quarter Split are not eligible for this event. Reminder: CSA approved catches pad that covers the foot and ankle to the top of the knee overtop of chain mail must be worn on the leg closest to the chopping stanchion. The Corral must a safe distance from the spectators and only competing athletes, event judge and timer are permitted inside. Two (2) team members must each cut through their own vertically supported cant. The wood should be 8 x 8in (20.32 x 20.32cm) for men and 6 x 6in (15.24 x 15.24cm) for women. Each competitor must use an unmodified, conventional axe. One per competitor. Competitors may share an axe as well. One replacement axe may be used in case of breakage and must be in the corral at the time of the event. The Event Judge must confirm safety rules are being adhered to prior to each team starting the event. The event will not begin if there is missing safety gear. 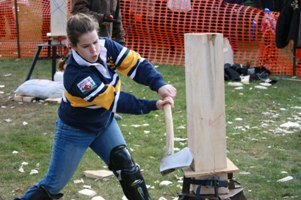 The first competitor only, must have their axe on the block of wood to start the event. The starting signal is: Timers ready, Competitors ready, 3-2-1-GO. The competitor must begin the event with the axe touching the wood at the start, and must remain on the wood until GO. Starting prior to GO will result in a disqualification. The second competitor may not begin until the first competitor has completed their chop. If they do, a DQ will result. Once the second competitor begins their chop, the first competitor cannot chop again. If the cant becomes dislodged from its stantions before completing the chop, it will result in a DQ. Slabbing rule is in effect. Competitors must try to avoid slabbing by spiking chopping faces. Three (3) spikes/nails (3in / 7.62cm) provided by competitor. If slabbing occurs, event will continue unless nails are not used. DQ will result. Inappropriate dress will result in a DQ. Competitors are not permitted to touch the block until the judge makes their decision. If done, a DQ will result. Time will stop when the second competitor chops completely through their cant. This event has a five (5) minute time limit, with a maximum two (2) minutes and thirty (30) seconds chopping time per competitor, or it will be recorded as a DQ. The timer shall notify the competitors after the first competitor or during the second competitor if the time limit is exceeded. If the first competitor exceeds the time limit, the second competitor may do their chop in the spirit of competition.